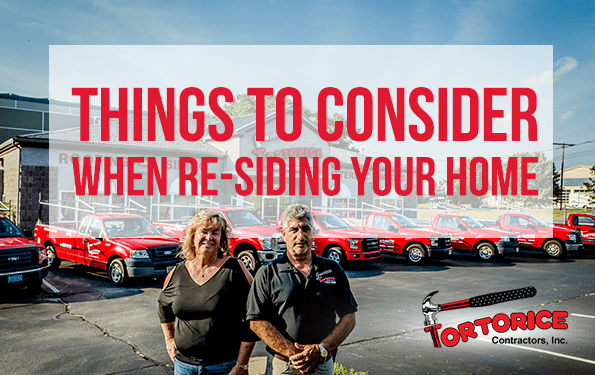 Franklin Township NJ Siding Contractor: Things to Consider When Re-Siding Your Home - Tortorice Contractors Inc.
Sidings are an important part of the house since they make it more beautiful and help to put it together. However, they are also one of the last house parts to be noticed unless they get damaged. According to some Franklin Township siding contractors replacing siding can play a big part in the security of your home. Aside from this, it helps to boost curb appeal and style. If you’re ready to re-side your home, here are some factors you need to consider. One of the most important factors you need to consider according to siding installers from Franklin Township NJ is durability. You want something durable because sidings can cost money. A durable siding will also save you a ton of money on repairs and maintenance. Durability is important because it is a mark of workmanship. A significant amount of money is needed to buy siding and the labor to install it. This is why siding should not only perform as it is intended to, but it should also last a long time according to siding companies in Franklin Township NJ. You also do not want to repeat the process every couple of years. Not only is this a waste of money but of time as well. For example, wood sidings are beautiful to look at and go well with a lot of home designs. But Franklin Township NJ siding contractors say that it does not always last long due to insect and water damage. However, you can consider vinyl sidings designed to look like wood because it lasts longer and is easy to maintain. Franklin Township NJ siding installers also say that you also need to consider maintenance. To make your siding last longer, proper and regular maintenance should be practiced by homeowners. This is why you should consider your lifestyle when choosing a siding material. If, for example, you are busy and don’t have a lot of time for maintenance, vinyl is a good choice because it does not require frequent maintenance. It also does not need special tools or solutions for cleaning it. All you need is a mild cleanser, a soft bristle brush, and a couple of hours and you’re ready to start the maintenance work. Wood, on the other hand, is harder to maintain according to siding contractors in Franklin Township NJ. Wood is vulnerable to insects and moisture so you need to inspect it periodically before the damage starts or spreads. Aside from this, wood siding is harder to maintain. You need to inspect, repaint, and repair damaged or rotting boards. To enjoy your siding for a long time and to save money, siding companies in Franklin Township NJ recommend that you choose a siding that suits your maintenance personality. Color is a personal choice that can show your personality and creative side. If color is very important to you, choose a siding material that has many different color choices. According to siding installers in Franklin Township NJ, vinyl cannot be painted. Even though you can buy vinyl sidings in many different colors, painting it will cause it to melt and damage your siding. For homeowners that want to repaint their exterior different colors every couple of years, there are other siding options that can match your needs. A good option for people that like to repaint frequently is fiber cement sidings. According to Franklin NJ Township siding companies, fiber cement can be painted whatever color you want. Just like vinyl sidings, they are also relatively easy to maintain. Wood sidings are also good options for painting. Not only do they give your house a classic look, they are also versatile when it comes to colors and painting. With wood and fiber cement sidings, you have a wide array of colors available to choose from. Siding contractors in Franklin Township NJ also recommend homeowners to consider their budget when it comes to re-siding. Siding materials come with different prices. Vinyl, for example, is cheaper compared to fiber cement. Wood is also a bit more expensive compared to vinyl. Another thing to consider when it comes to your budget is the area that you want to re-side. A small area means fewer materials will be used so there is less time spent on installation. However, larger areas cost more to install. Franklin Township NJ siding contractors recommend inspecting your sidings thoroughly when you’re thinking about re-siding your home. These factors can greatly influence your choice of a siding material. Re-siding your house can protect your family while beautifying your home and adding to its value. Siding companies in Franklin Township NJ recommend re-evaluating these factors to help you choose the best choice.